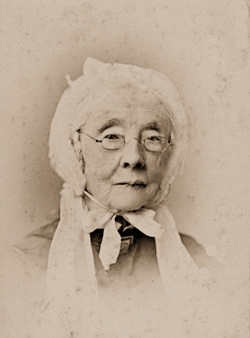 Matilda Sewall was born on 22 September 1797 in York, Maine.1 She was the daughter of Daniel Sewall and Dorcas Bartlett.1 Matilda Sewall was baptised on 8 October 1797.2 She married Deacon Stephen Sewall, son of Stephen Sewall and Abigail Bartlett, on 20 May 1824 in Kennebunk, Maine, (cousins. )3 Matilda Sewall died on 2 May 1892 in Winthrop, Maine, at the age of 94 of "la grippe"
[S106] Maine Families in 1790, Vol. 7 p. 451. [S205] Newspaper, The Congregationalist, (Boston, MA) Thursday, May 12, 1892. [S205] Newspaper, Boston Daily Advertiser, (Boston, MA) Tuesday, May 03, 1892. Matilda B. Sewall was born on 18 May 1826 in Boston, Massachusetts.2 She was the daughter of Deacon Stephen Sewall and Matilda Sewall.1 Matilda B. Sewall married Dr. Albion Parris Snow on 24 May 1852 in Winthrop, Maine.3 Matilda B. Sewall died on 9 June 1893 at the age of 67. [S364] Eben Graves, The descendants of Henry Sewall. Vol. II (Unpublished), #145. [S232] Ancestry.com, Federal Census Mortality Schedules, 1850-1885. [S313] Washington Post, 20 Jul 1960. [S232] Ancestry.com, Ohio Obituary Index, 1830s-2011, Rutherford B. Hayes Presidential Center. Child of May Helena Sewall and John F. Norman Jr.
[S232] Ancestry.com, Iowa, Wills and Probate Records, 1758-1997 for Ruth C Sewell. [S3] Nina Moore Tiffany, Samuel E. Sewell: a memoir, p.6 note 1. [S365] Eben Graves, The descendants of Henry Sewall. Vol. II (Unpublished), p. 299. [S238] [John Sayward Trott], Genealogy of the Trott Family, 22 March 2006. [S365] Eben Graves, The descendants of Henry Sewall. Vol. II (Unpublished), p. 300. [S365] Eben Graves, The descendants of Henry Sewall. Vol. II (Unpublished), p. 301. [S392] Website findagrave.com (http://www.findagrave.com/) "# 77741319." [S392] Website findagrave.com (http://www.findagrave.com/) "# 3500859." [S77] Sybil Noyes and Charles Thornton Libby & Walter Goodwin Davis, Genealogical Dictionary of Maine and New Hampshire, p. 255. [S392] Website findagrave.com (http://www.findagrave.com/) "# 22910014." [S325] Usher Parsons, Genealogy of the Frost family, p. 10. [S392] Website findagrave.com (http://www.findagrave.com/) "# 63783886." [S392] Website findagrave.com (http://www.findagrave.com/) "# 57664835." [S231] 1930 US Census, Island Falls, Aroostook, Maine. Michael “Mike” Casey Sewall 87 of North Liberty died Friday, July 29th at UIHC of complications related to dementia and Alzheimer’s disease. To celebrate Mike’s life friends may join the family Thursday at the Elks Club, 637 Foster Rd, Iowa City from 3:30 to 6 pm. In lieu of flowers memorials may be directed to Pathways Adult Day Care, 817 Pepperwood Lane, Iowa City, IA 52240. Arrangements are with Lensing Funeral and Cremation Service. Mike was born August 28, 1923 in Iowa City, the son of Frank and Gertrude Casey Sewall. He was a graduate of City High School and attended the University of Iowa. Mike was a pilot in the US Air Force during World War II. On February 27, 1954 Mike married Mary Margaret Jacobsen in Iowa City. Mike had been employed by National Cash Register (NCR) for over 40 years. He was a member of the Elks Club and the City High School and UI Alumni Associations. He liked to garden, go boating and do his woodworking. Mike enjoyed the winters spent in Mesa, Arizona. Mildred Yarletts Garrett. 87. of New Wilmington RD 3, Mercer County, formerly of Pulaski, died in Jameson Hospital at 3:19 p.m. on May 6, 1996. Mrs. Garrett was born in Lackawannock Township, Mercer County, on May 3, 1909, to James C. and Eva V. Angcll Sewall. She married George J. Yarletts on April 19, 1928. He died on Aug. 3, 1964. She then married Weldon S. Garrett on Feb. 10, 1974. He died on June 12, 1970. Mrs. Garrett was a homemaker, and is retired from the Garrett Locker plant in New Wilmington. She was a member of Neshannock Presbyterian Church of New Wilmington and a member of the American Association of Retired Persons. She is survived by two sons, Charles L. Yarletts of New Wilmington and James B. Yarletts of Pulaski; two stepsons, Lyle Garrett of New Wilmington and Robert Garrett of New Castle; three stepdaughters, Margaret Luts of Volant, Marian Nelson of Pittsburgh, and Janet Enright of Portersville; seven grandchildren and seven great-grandchildren. She was preceded in death by two husbands, two sons, Donald Lee Yarletts in 1931 and Wesley "Buzz" Yarletts in 1970, three sisters, Dorothea Spears and Ethel and Alice Sewall, six brothers, Glen, David "Shorty," Ralph, Charles, Wayne and Floyd Sewall. [S392] Website findagrave.com (http://www.findagrave.com/) "# 136703539." [S392] Website findagrave.com (http://www.findagrave.com/) "# 137816270." [S392] Website findagrave.com (http://www.findagrave.com/) "# 137815431." Dr Sewall spent his boyhood and youth in New England and after completing a course of study in the high school of Portsmouth, New Hampshire, with a class of 1895, he entered Dartmouth College, where he won his Bachelor of Arts degree in 1899. A mental review of the broad field of business led him to be decision to take up the practice of medicine and surgery as a life work, and with this end in view, he enrolled as a student in the Jefferson Medical College, where his Doctor of Medicine degree was conferred on him in 1903. For two years he was resident physician at St Agnes Hospital in Philadelphia, Pennsylvania, and then spent eighteen months as a physician at Girard College, gaining broad and valuable knowledge and experience through his hospital work. When that period had elapsed he moved to Bridgeton in 1906, and while he continued in general practice since, he largely specialised in surgery during the next twenty years, winning high rating through the high skill and efficiency which he developed. He possessed the calm nerve, the steady hand and the sound judgement of the able surgeon and since going to Bridgeton, has served on the staff of the Bridgeton hospital, and in 1925 became chief surgeon of the institution. Dr Sewall was a president of the Cumberland County Medical Society, a member of the New Jersey Medical Society and the American Medical Association and a fellow of the American College of Surgeons. His professional activities also included service as a regimental surgeon of the 82nd division in World War I, with the rank of major. [S153] Charles Nelson Sinnett, Sinnett's Sewall genealogy. [S205] Newspaper, The Portsmouth Herald, 9 June 1945. [S205] Newspaper, The Press of Atlantic City (NJ), 22 February 1992.